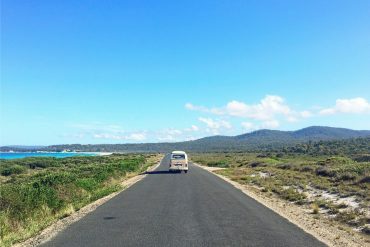 The Great Eastern Drive extends between Orford and St Helens on Tasmania’s east coast. At around 220 kilometres, this is a road trip that can be experienced in a weekend, a week, or longer. The more time you spend here, the more you will discover and enjoy, so take your time, just stop…and wander. You can start your Great Eastern Drive road trip from St Helens in the north, or Orford in the south. Follow the road’s gentle curves through east coast wine country, beach towns, forests, farmland and the open coast. Stop off along the way at the world’s best beaches, visit cellar doors to taste award-winning cool climate wines, taste the region’s wonderful produce and seafood and explore its famous national parks. Travel inland to explore valleys, waterfalls and mountains and drink in the endless views of the vast, blue ocean as you journey along the coast. There are all kinds of ways for you to experience your Great Eastern Drive road trip. We’ve put together some suggestions for your journey here, with Orford as the starting point. But, if you’re in the north of the state you can easily experience the same trip in reverse, starting in St Helens.